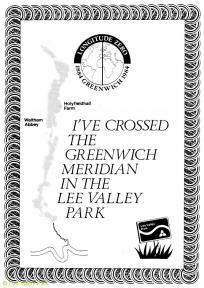 In 1984 as part of the Meridian’s ‘centenary celebrations’, Lee Valley Park issued ‘I’ve crossed the Greenwich Meridian in the Lee Valley Park’ certificates here at Hayes Hill Farm. They also organised a celebration bonfire that was lit on 13 October 1984. Although the Park Authorities have made much of the presence of the Meridian on their other sites, the marking here only appears to have ever been a temporary one. The Meridian crosses the speed-hump that features in the 2007 image set and would have been at or close to the site where the ‘Meridian Crossings’ took place.